I qualified in 1992 from the Northern Institute of Massage (NIM) as a Sports and Remedial massage therapist, having been an actor pretty much from birth, but finally stepped off ‘the boards’ in 1996 when I went full-time as a therapist. I worked as part of the original Holmes Place treatment suite in Chelsea before setting up in private practice alongside Philip Waldman, Craig Coman and Halina Osinski. In 2006 I established Corehealth, a Pilates and Treatment clinic in Crouch End with his wife Lorraine and in 2008 opened Chelsea Natural Health Clinic in partnership with Philip Waldman, where I practice two days a week. I also treat the staff and clinicians at Great Ormond Street Hospital once a week as part of their amazing staff wellness scheme. 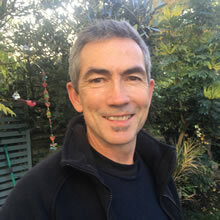 As an experienced Sports and Remedial Therapist, I employ Remedial therapies, Sports Massage, Pilates, Myofascial bodywork, K-Taping, Dry-needling, Cranio-Sacral Therapy, Hypnosis and Mindfulness to facilitate healing, change and balance. I treat Sports Injuries, any muscular and skeletal complaint, work-related postural issues, stress conditions, pre and post natal discomfort and anxiety, and issues relating to pressure, stress and anxiety. Although I am able to treat a wide range of complaints, as an experienced marathoner and ultra-marathoner, I have I think a strong understanding of running and extreme exercise issues. Having run the London Marathon 9 times and over 30 other marathons and ultras (including two Comrades) I have looked after hundreds of runners through their entire training programmes, dealing with their injuries, niggles, fears, nutritional issues and most importantly basic maintenance. Aside form runners I look after cyclists, tri-athletes, swimmers, racket athletes, musicians (very athletic), netballers, footballers, cricketers, and more recently roller-derby-ers! My mantra for anyone who exercises more than three times a week is: Treat yourself like an athlete. If you were an elite or professional athlete you would have a team of people to take care of you, but as mere mortals we need to do it ourselves. Look after your body and it will look after you. I can help you do this. As a deep tissue, manual therapist, I also understand the pressure and stresses that are inherent in our lives and how this manifests, affecting how we then behave and treat ourselves. Of course injuries or pain do just occur, but by and large we are the architects of our direct experiences, whether through overuse or through neglect. My job is therefore not just to treat the symptoms but to try and find a better and more flexible way for you to continue to train, to work, toplay, to exercise and ultimately to live a more fulfilling life. As an experienced therapist I am obliged to continue my training and regularly attend cpd workshops and courses particularly the sports osteopath John Gibbons Bodymaster series. I have most recently qualified as a level 1 Pilates matwork instructor (Stott) and run a beginners class on a Wednesday morning. I also teach Mindfulness Meditation using the Mindfulness Based Stress Reduction programme. Finally, his passion is helping others and himself to get re-aligned with our values, with what matters to us, when this happens we will know what we need to do and why we need to do it. This is the Lighting Fires bit. I am a member of the London and Counties Society of Physiologists. I am able to take card payments. I had back surgery 10 years ago (a mistake) and currently work long days in the City, frequently flying and rarely looking after myself properly. My back frequently flares up and I have seen 100s of physios, osteos, chiropractors, surgeons, etc. over the years to find a solution / help manage my back. Nobody from any of these disciplines matches Simon’s extra sensory understanding of the back, body and mind. I would recommend him to anyone and frequently do to friends, colleagues and clients. I work in an incredibly demanding industry which makes me pretty fussy, for thers who also seek out extremely high quality service, I happily recommend Mr Simon Heale.